It's six years to the day since we took the short flight from St Petersburg and landed in Tallinn. It's been a year since I last posted on this blog. Today my wife, Rachel, is in hospital, having her fourth operation in the last twelve months. Hopefully, this is the last one. She's cancer-free, and it's going to be all good from here on. Six years. It's been not an insignificant time, and yet, looking at this photo of the four of us about to board the flight, I doubt there was much of what was to take place over the following years that we might have imagined on that day. I've covered all this (the good, the bad and the ugly in my three-part series, by the same title, last year). So I won't repeat myself. But I felt it was important to share something today, this day of extremes, this day of another annual milestone, even if we are forced (as a family) to be apart due to this final operation. For Anya, who was not even two years old when the photo was taken (her birthday is in three days), all she knows of life is where we currently are. It's the only home she remembers. She has no recollection of our time in St Petersburg, nor does she even remember the rental flat we were about to arrive in six years ago. Home as we now are is the only home Anya has ever known. That makes me stop and think, pause to ponder. It gives some perspective. For Mia, she was about to embark on another change. Six years on she's into her fifth language, three of which she has fluently. When we arrived in Tallinn, her Russian was very strong, and she used it often. Now, Mia claims she is more natural in Estonian (no small achievement there!) and though she doesn't have as much practice in Russian, it is there when she needs it. She doesn't want to lose it, either. One thing that's come from our move abroad (and it will be ten years in total this summer!) is that Mia, for sure, will always be a great linguist, Anya also. Anya tends to shy away from speaking Estonian (she doesn't have the Russian like Mia does, as she was too young when we left), but she will surprise us often with using it. Her language teachers (Estonian and French) both report how well she is doing. I guess living in other cultures really is good for a child's language abilities. As a family, we've set about learning the fifth language together. Nothing offered yet as to why that is, but it's a great thing to do together and might, one day, come in useful. I'd never really thought about this before leaving the UK. I'd always assumed the middle of the night (say 3 or 4 AM) was the coldest, just as you assume that either the end of December or January to be the coldest months. Yet during the coldest spells (and we are maybe in the coldest spell we've had since moving to Tallinn, with temperatures pressing down to -20c this last week), it's the coldest right up to the point just before the sun rises. It makes perfect sense, of course. Until the sun appears, there is no heat, nothing to change to cold. So it figures that those moments before sunrise (therefore the longest amount of time since the sun was up) that it is then, in fact, the coldest. That means 8, 9 or 10 in the morning can be colder than at night. Just as February (we soon learnt this from our time in this part of the world) is colder than the months before it. The lesson I'm trying to draw here, and something we've been learning ourselves, is that sometimes the toughest moment is the time immediately before a breakthrough, not halfway through something. It can be at the time you think it'll never change when the end arrives (at last). Hopefully, today's operation (the last one that is planned) signifies that shift for us, even if March 1st does little to convince us that winter is over and spring is just around the corner. Here, and with a heavy snowy winter, it'll be many more weeks before we see the grass again. It might be green by the end of May. Winter changes lots of things, of course. Spring (and the warming sunshine) allows new growth. It's the course of nature. Coming out of our winter (figuratively speaking) as a family, we know there is much to look forward to. We know much has been lost, also. Things that we had around us, things we maybe took for granted, that are no longer a stable part of our life, even if in the background. How these things begin to blossom and bloom in the season ahead, we will have to wait and see. Something that has been encouraging, in a way we couldn't have imagined six years ago, is the amount of non-churched people who are drawing strength and asking questions, because of the way we've walked this path recently through cancer. We've been vocal that this isn't God's doing (the disease). We've been upbeat (I hope) about our need for God, especially in a time like this. And we've been told by many that what we are sharing is helping them. One of the things I've been pondering recently is the subject of When God Doesn't Answer Our Prayers or When God is Silent. I get what is being asked, and it's good to have that conversation, but I also think it's foolish to position such a statement or question that way. Because God also hears our prayers, and I'm convinced he always has an answer. I was chatting this through with someone recently and likened the above to radio waves. It would be like someone, who because they could no longer pick up a station on their radio (or WiFi on their device also works for this analogy), assuming that the radio station had gone off-air (or that the internet had switched off). A broken radio or device in no way means the signal is gone, it's just our ability to hear or understand the signal that has been momentarily affected. A loving God and Father will always hear the prayers of his children. As a human, I have to accept that I don't know all things, only God does. So when something happens that I can't explain, it doesn't change who God is. I've touched on this before but will repeat it here. Being a Christian, and trusting in a loving God, it means I give up my right to know why something happens if there is no obvious answer. I just choose to trust. It's 10 AM as I type this line. My wife is most probably on the operating table as I write. Those dreamers pictured in that photo at the top from six years ago couldn't have imagined this would be how we'd mark today, and yet the following is also true. We've understood a deeper aspect of God and his nature (and his goodness!) that we might never have known, had we not gone through these last eighteen months. No, that doesn't mean God made this happen, and yes, I guess being all-knowing he would have been aware of what was going to happen back on that day, even if we didn't. But he exists aside from time, knowing the end as much as the beginning. And one thing I've come to learn over this last year is that he's got a much bigger plan for us and that he's been thinking about it for far longer than we have ever realised. 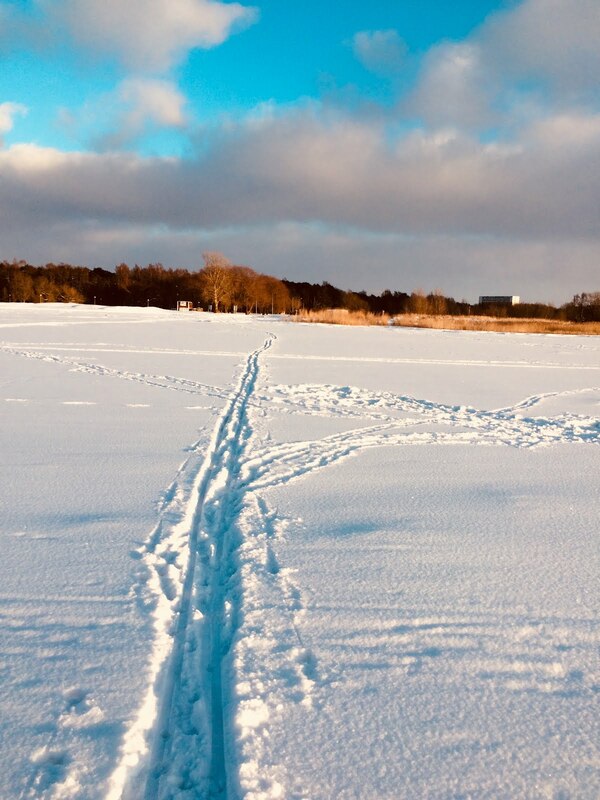 I recently went on a ski down through the forest to the frozen sea near our home. I took two pictures, knowing, in a way, God was speaking to me through them. The caption under each is what I felt God say for both. 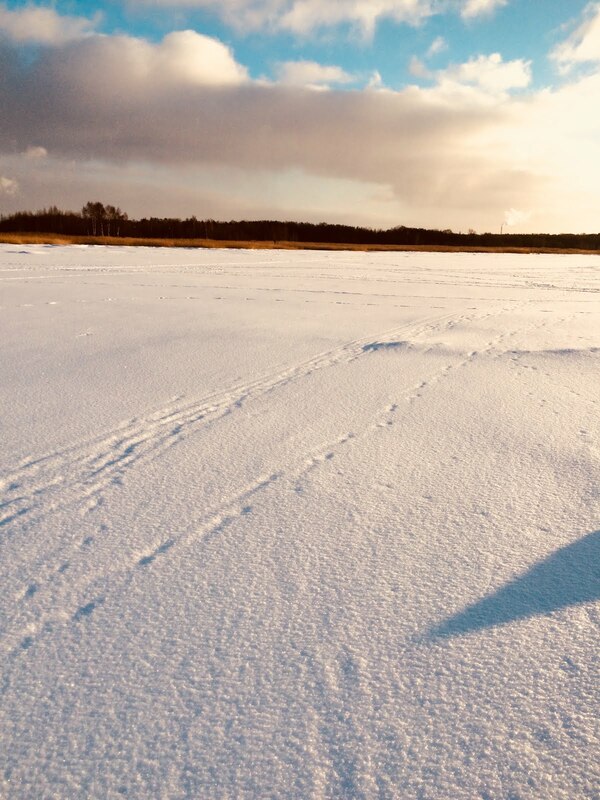 I'd been following tracks in the snow that took me further out over the frozen Baltic. It was fun, and the tracks helped me cut through the snow a lot easier. But the tracks didn't take me far enough. 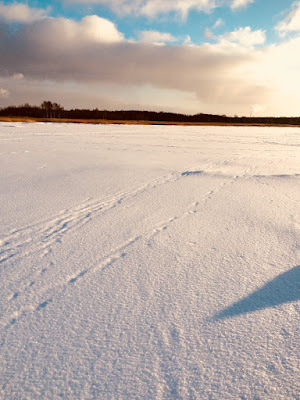 Suddenly, in front of me, there was a whole mass of untouched snow. I knew I needed to forge a new path. 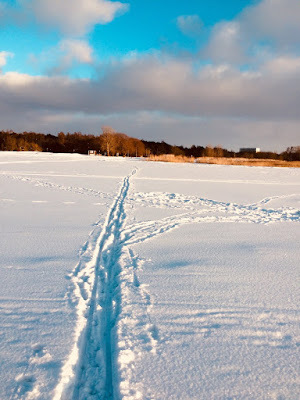 New adventures await, but I had to now make my own tracks––my own marks––in the snow. Not a lot, for now. But we've sensed 2018 is our year (I recently heard that 8 is the number of new beginnings). That figures as it was 2008 (in the eighth month, too) when we moved to Russia. We've come through a dark period, and just like the dawn, even though we are still in the thick of it, change is moments away. Today gives me hope. It's the last operation. Rachel is through it all––she's done brilliantly! We've coped well. The girls have been amazing. Yes, there had been some really tough times. It's not ignoring them to say good times are ahead. But it's looking forward with hope, with excitement. We don't know what this new day will bring, though we have a sense. We don't know when this new day with dawn, though we feel it's closer than ever.